Leadria E. (Hawkins) Lewis, 99, of Springfield, Ohio passed away Thursday, October 25, 2018. She was born November 20, 1918 in St. Clairsville, Ohio the daughter of Joseph and Georgia (Rogers) Primus. Mrs. Lewis retired from Belmont City Schools after many years of dedicated service. 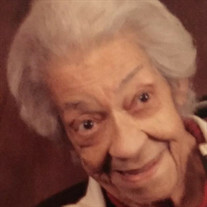 Her memory will be cherished by her son, Reginald (Clara) Hawkins; 6 grandchildren, Marsha Lewis, Laroilyn Byrd, Vickie Crowe, Leroy (Rita) Lewis Jr., Joseph (Karen) Lewis and Kirk (Carol) Couch, 19 great grandchildren and one great-great grandchild and a host of other relatives and friends. She was preceded in death by her parents, husband, Louis Lewis; daughter, Karyl Lewis; her siblings, Alma Primus, Emily Starks and James Primus and her granddaughter, Belinda Metcalf.